Szeroka, which is really more a square than it is a street, represents the heart of the old Jewish district. It was around here, back in the fourteenth century, that settlers first laid down their roots in the area, and the sense of a medieval market place is still palpable. Two of the most important synagogues are to be found here, the Old and the Remuh, and the latter has a small cemetery attached. A number of cafes and restaurants have sprung up in recent years, and these have an emphasis on Jewish traditions. They are, undeniably, squarely aimed at tourists, but they have been done tastefully, providing a dignified and, at times, vibrant echo of a now lost world. Szeroka is well preserved and, with its rambling roof-line and quaint merchant houses, it is a deeply evocative place. 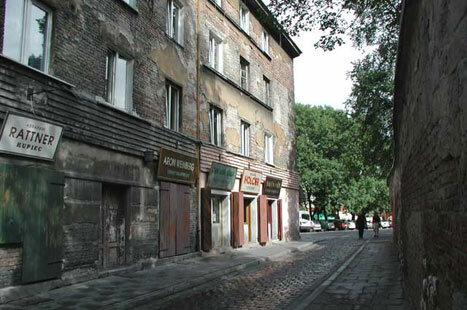 'Kazimierz is at times reminiscent of the cities of the Orient' noted a guidebook from 1938, 'its people spend their lives outside their houses,' and the streets were animated by their 'raucous conversations' and 'rich mimicry and gestures' The author also evoked the spiritual dimension of the area: 'Towards evening on feast days Kazimierz grows quiet. Jews in long robes and fox fur-trimmed caps walk along the streets, and candles gleam in the windows. The houses of worship - the Old, the Remuh, and the High Synagogue - fill up with people at prayer'. I think you caught the spirit of Szeroka street.To everybody.If you want something special, try `Klezmer hois, it`s like comming home to granmother. Hi, Jerry. It's on our map here http://www.cracow-life.com/map/map.php. Find Starowislna street, then look west a bit. Or search for "Szeroka" ... cheers. why is the street not on google maps? Looking forward to the Shalom on Szeroka party next month. Plane ticket booked!